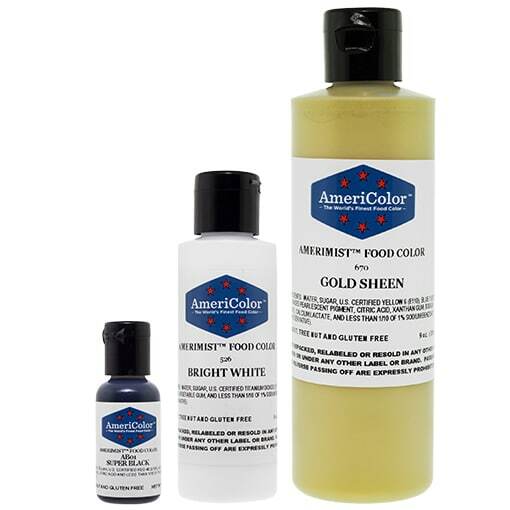 AmeriMist Airbrush – AmeriColor Corp. Product made in the United States. Ingredients: Water, sugar, and one or more of the following U.S. certified colors: Blue 1 (E133), Blue 2 (E132), Yellow 5 (E102), Yellow 6 (E110), Red 3 (E127), Red 40 (E129), titanium dioxide (E171), mica pigment, vegetable gum, modified corn starch, citric acid and less than 1/10 of 1% sodium benzoate and potassium sorbate as preservatives. Product made in The United States. Ingredients: Water, propylene glycol, one of more of the following U.S. certified colors: Blue 1 (E133), Red 40 (E129), Red 3 (E127), Yellow 5 (E102), Yellow 6 (E110), citric acid, sodium benzoate, potassium sorbate. Does not contain peanuts or tree nuts and is not manufactured in a facility or on equipment which processes nut products. Kosher Certified. Product made in The United States. Ingredients: Water, sugar, and one or more of the following U.S. certified colors: Blue 1 Lake (E133), Blue 2 Lake (E132), Yellow 5 Lake (E102), Yellow 6 Lake (E110), Red 40 Lake (E129). Does not contain peanuts or tree nuts and is not manufactured in a facility or on equipment which processes nut products. Kosher Certified. Product made in The United States Ingredients: Proylene Glycol, Lecithin, and may contain one or more of the following U.S. Certified colors: Blue 1 Lake (E133), Blue 2 Lake (E132), Red 40 Lake (E129), Yellow 5 Lake (E102), Yellow 6 Lake (E110). Does not contain peanuts or tree nuts and is not manufactured in a facility or on equipment which processes nut products. Kosher Certified. Product made in The United States. Ingredients: Sugar, egg whites, gum arabic, ammonius alum, sodium alginate, food starch, salt, calcium lactate, and artificial vanilla flavor. Does not contain peanuts or tree nuts and is not manufactured in a facility or on equipment which processes nut products. Kosher Certified. Product made in the United States Ingredients: Water, corn syrup, sugar, modified food starch, carrageenan, sodium citrate, citric acid, salt, natural and artificial flavor and 1/10th of 1% sodium benzoate and potassium sorbate (as preservatives). Product made in the United States Ingredients: Water, sugar, U.S. certified Red 40 (E 129), Blue 1 (E133), Blue 2 (E132), Yellow 5 (E102), Yellow 6 (E110), citric acid, and less than 1/10th of 1% sodium benzoate and potassium sorbate (as preservatives).